When it screened back in 2010, Quentin Dupieux's Rubber was one of the more polarizing films to ever play at After Dark. I mean, when you play a movie about a killer tire at a horror film festival, you might expect something slightly more conventional, more Maximum Overdrive-ish. That, of course, was not what we got. Dupieux presented a film that was hilarious, deeply philosophical in the most effortless of ways, and all of this wrapped around a love letter to '70s and '80s horror. With a telepathic tire hell-bent on revenge. I'm not entirely sure, then, what I was expecting when I walked into Dupieux's newest feature, Wrong. I can categorically say that this is not a retread (heh) of Rubber. In fact, it may well be the anti-Rubber. It's not scary, it doesn't have much to say, but goddamn is it ever funny and it is still the best thing I saw in the entirety of After Dark. 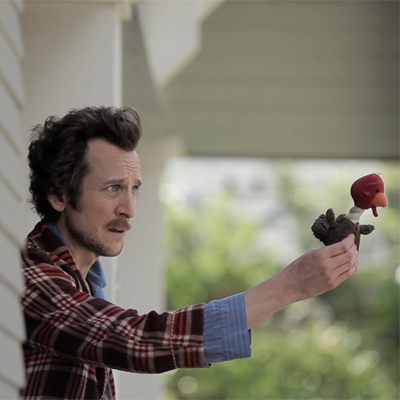 The movie centres around Dolph (Jack Plotnick), a mild-mannered regular guy whose dog, Paul, has gone missing. In his quest to find his best friend, Dolph encounters an increasingly-bizarre cast of characters and bounces from one surreal situation to the next. There's his next-door neighbor Mike (Regan Burns), who dreams of driving to the literal end of the earth, the weirdo gardener (Eric Judor), always eager to please despite a troublesome palm tree that keeps turning into a pine tree, the girl from the pizza place (Alexis Dziena) who enjoys long conversations about why a rabbit would need to ride a scooter in their restaurant's logo, a detective (Eastbound and Down's Steve Little) whose techniques include harnessing the memories of dogshit and, of course, the real star of this film, Master Chang (William Fichtner), a specialist in pet telepathy. These characters are weird enough in and of themselves, but as they begin to intersect and interact with one another, there's a glorious madcap feeling around the whole thing, even in the world Dupieux has crafted, where such surreal phenomenon as an office where water constantly pours from the ceiling is a fact that never warrants a mention. It's a world I can't help but want to visit. The performances here are all wonderful and come together nicely — nearly everyone seems to revel in the absurdity of this film and it all comes off as cohesively as one could expect from this sort of thing. The colour palette is much more vibrant and sunny than the muted tones of Rubber, and in general this creates a much more upbeat atmosphere all around. After a week of torture, violence, and end-of-the-world scenarios, Wrong was exactly the kind of nutbar comedy I needed. Only Dead Sushi managed to reach this level of mindfuck hilarity, but this has more of a heart to it, in my opinion. Maybe it hit home a little more for me as a dog-owner. All I know is that if a movie like this is Wrong, I don't want to be right. (I'm here all week, folks). Check out all of our coverage of the 2012 Toronto After Dark Film Festival right here.